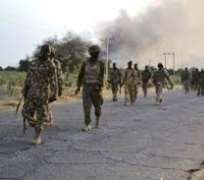 As many as 200 Nigerian soldiers were reportedly killed by Boko Haram terrorists during recent attacks at Metele in the war-torn northeast. Soldiers complained of top level military corruption, accusing the Nigeria army chiefs of using them and the war on terror to make billions while leaving the nation's troops at the mercy of terrorists, with obsolete and non functional ammunition and military vehicles, including MRAPs and tanks. The video displayed so many destroyed obsolete military vehicles and soldiers still left dead in the vehicles after the latest attacks. The soldiers have reportedly been begging villagers for food and killing and eating snakes while the military chiefs are accused of embezzling funds and living large in the nation's capital. Current president Muhammadu Buhari came into power on the expectation he will fulfill his promise to defeat Boko Haram but this has only been fulfilled in the media with false claims of defeat and suppression of true accounts of deaths and regular abductions as the press has been bribed and banned from penetrating and reporting on the northeast war torn territories.